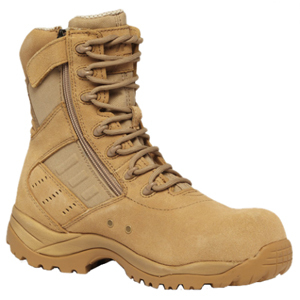 The Tactical Research TR336 Z CT Guardian Lightweight Side Zip Composite Toe Boot was designed for military contractors looking for a high performance hot weather boot. This boot features a side zipper for quick entry/removal and stain-resistant smooth cowhide leather for a sharp appearance all the time. The composite toe makes this one of the lightest safety boots that we carry. It is electrical and impact ANSI compliant and features Belleville's patented TR-1 orthotic Insole for maximum comfort. Good lightweight boots. I was really impressed with the insole that came with these boots. They were very similar to my superfeet that I use in my cross trainers. Zipper is convenient. Clean looking and light enough to run in. Hope they hold up because they are made in China.